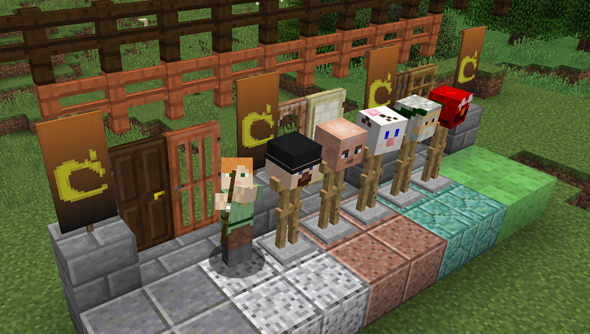 Mojang have pre-released Minecraft’s 1.8 patch today. It represents more than 300 days of work – the longest amount of time its dev team have spent on a single update. And it’ll be officially published in the launcher on Tuesday, September 2. A large proportion of Minecraft 1.8’s man-hours over the past year have been poured into rebuilding the game’s infrastructure. “These changes consist of large game structure changes such as replacing the hard-coded ‘block renderer’ with a system that is able to read block shapes from data files, or performance enhancements such as multi-threading the client-side chunk rendering,” wrote Mojang’s Jeb. Some of those “many, many changes” will be invisible. Others will be bunny rabbits, endermites, and sentient sea-mines. 1.8 is going to work wonders for home-building – the primal urge at Minecraft’s core. Besides new stone variants, players can now retrieve sea lanterns and slime blocks, or reserve corners of their abodes for iron trapdoors, banners, armour stands, barriers and new door types. Buttons can now be placed in the ceiling – a fact that’s going to revolutionise somebody’s forest rail network, somewhere. Mojang have added a new player model with smaller arms. Multiplayer skins will benefit from the ability to edit each arm and leg independently, and some new layering options. But it’s the promise of new surprises in Survival mode that stirs the old chest-butterflies. Rabbits will be passive, and can be turned into mutton – unless you’re unlucky enough to come across its ‘killer’ variant. Underwater temples conceal a golden prize, but are patrolled by Guardians with ranged attacks. And Endermen will now leave burrowing, purple grubs in their wake. Perhaps best of all, floating islands are back in Minecraft. We’ll probably have to update the 30 best Minecraft seeds. What’s got you most excited to spawn a new world?